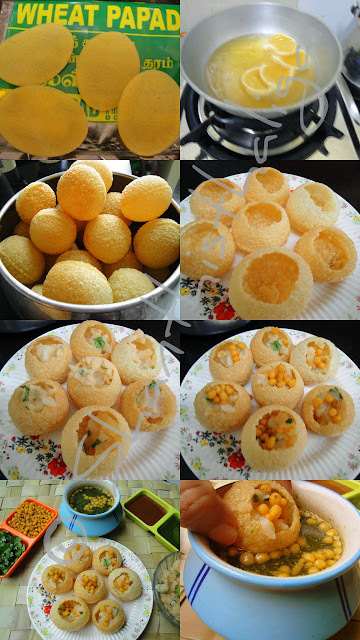 Pani puri, also called as golgappa and phuchka, is a popular street snack. Pani puris can be presented in one's own way with different ingredients. The filling can be of your choice, with any of these ingredients, boiled potatoes, boiled green gram dhal, sev, boiled chickpeas, onions etc. I do not use onion and garlic, and so this can be had even during vrat days. I personally prefer to have it with boiled and mashed potatoes alongwith sev or boondhi. 1. Ensure oil is hot before frying. If oil is not hot, the puris will absorb oil and will not puff. 2. Test the heat with one puri. If the oil is hot enough, the puri rises fast to the surface of the oil. 3. While frying keep the stove in medium flame. If it is smoking hot, the puris will be burnt. I made the puris from store bought ready to fry papads which are available in departmental stores at coimbatore. However, I will post home made puris for panipuri in a separate post. Black salt - 1/2 tsp. Roasted cumin powder - 1/2 tsp. Mix all ingredients given under "for teekha pani". Add more or less of any ingredients according to your tastebuds. Finally, while serving, add boondhis. HOW TO PREPARE THE STUFFING? Boil potatoes, peel and mash roughly. Add all the ingredients given in "for the filling". Mix well. Keep aside. Take a poori, crack a hole in the centre and stuff with the potato filling, garnish with boondhi, dip and fill in with teekha pani and serve immediately. If desired, add some green chutney and sweet chutney while stuffing. I can consume countless number of these pani puris that never stale however many times one eats them.Your forte is your beautiful presentation.